Book trailers can be a great means of getting the message out about a new book, and they’re also a chance for a book marketing and publicity team to develop a creative way for readers to experience the novel. Whether you’re a book blogger, an agent, a book marketer, an author, a publicist, or just have an interest in the next hot YA novels, your thoughts on what makes a book trailer successful are valuable. No matter how great a book is, if your first experience of it is through an unprofessional looking trailer, then maybe it won’t get as much attention as it deserves. 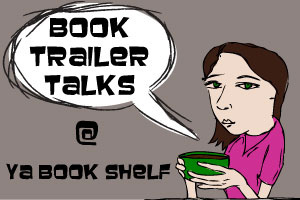 For these reasons and the fact that I just really love a good book trailer myself, YABookShelf.com has organized a weekly meme called Book Trailer Talks. Each week on Book Trailer Talks @ YA Book Shelf, we’ll answer a question or perform an activity on our blogs related to this burgeoning means of marketing teen novels. You can participate with me and hop along to the other participating blogs each week to see how they responded to the question. You will likely learn about books that you’d never heard of before as well though, which means that your to be read pile may very well grow. Just a friendly warning. You’ll also learn what question we’ll be tackling the following week in advance, so you can have a chance to think about it before you post your answer. This week’s question is: What are your favorite animated book trailers? Well, the truth is that if you had the chance to check through all of the teen book trailers posts that I’ve previously written for YA Book Shelf, then you’ll know that I absolutely love animated book trailers. It is, by far, my favorite aesthetic look and feel, possibly because I’m a fan of illustration in all it’s forms. 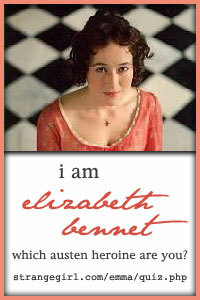 Therefore, for the inaugural Book Trailer Talks post, I thought it would be great if we all celebrated our favorite(s). I, unfortunately, couldn’t choose only one, and instead have my three favorite animated trailers…for the time being. First is Holly Cupala‘s book trailer for her debut novel, Tell Me A Secret. The illustrations used in this trailer as well as the colors selected are unlike anything used for the book jacket, but the edgy look totally fits with the novel itself. Next is the book trailer for a lesser known, but nonetheless great YA novel, called Rhythm And Blues by Jill Murray. Jill actually made this trailer herself, using the illustrations used for the book cover, but it doesn’t just replicate the book cover copy. Hope you like it, too. The final book trailer that I want you to check out uses animated illustrations with a very different style from the previous too trailers, and instead, highlighting the fun and cute feel of Prom & Prejudice by Elizabeth Eulberg. Again, the illustrations don’t draw on the book cover’s artwork, but uses some of the same colors. What did you think of my animated book trailer picks? And most importantly, what are your fave animated book trailers? Create your own post and link it up below, and then, take the time to see what other animated book trailers are exciting to everyone else. Those without a book trailer talks article will be removed from the link list below. Next week’s question is: Can you remember the first YA book trailer you ever saw? Did you like it then and what do you think about it now after having seen other book trailers in the interim? I like that Tell Me A Secret trailer, because you get to know the character and her voice, and have a sense of the atmosphere and emotional intrigue of the book, but it doesn’t sound like they’re just repeating the back-cover blurb. The Prom & Prejudice one looks good but sounds way too infomercially to me. Hahaha! Many of your thoughts here are things I was thinking too. Maybe we’re mind readers of one another. I completely agree with you about the Tell Me A Secret trailer. I believe that, rather than use the back cover blurb, they used a section of the actual novel for the voice over, so it does everything that you said: shows character, voice, atmosphere and emotional intrigue. For the Prom & Prejudice one, yeah, it is infomerically, and it’s definitely a point or so against it. But aesthetically, I just loved all the little details of it. One thing that the creator did, however, which contradicts the novel itself is the implication that guys attend Longbourn Academy when the yearbook opens. In fact, Longbourn is an all girls school, which is something that anyone even reading the blurb would know. I guess s/he didn’t get that far. Can’t wait to read your article on BookMadam! I love this new feature you’ve got on your blog! I love to watch book trailers (and movie trailers for that matter), so this subject is totally up my alley. The trailer for Tell Me a Secret is definitely up there on my Favorite Animated Trailers list. The combination of mood, music, sfx, VO, and subject matter create a pretty awesome video. And it’s different. I think that separates it in a huge way from other YA trailers. One way to grab my interest is to make something entertaining. I love the color, the energy, and most of all the music that’s used in this trailer. It’s hard not to watch it with a big huge smile plastered to your face. This was the first time I actually wanted to read a novel based on book trailer alone. I think there’s something to be said for trailers that have to start out from absolutely nothing. While I already know about the care that goes into producing trailers shot via photography/video, I tend to think of animated trailers as more handcrafted, and I can definitely appreciate the time and effort that goes into that too. Yay! I’m glad you love Book Trailer Talks! I agree with you 100% about the Tell Me A Secret trailer – it has everything to the point of being almost cinematic – which is something that a lot of YA trailers lack. Thanks for sharing the trailer for Being Jamie Baker with me. I definitely has great energy and colors. My only criticism is that it’s a little too long for my taste, but still, I can definitely see what you like about it. Yeah, I know what you mean regarding animated trailers and the time/effort that goes into making them. I like that the creator has to imagine everything and make their vision come true either by hand, by computer-generated illustrations, or by thousands of images for stop-motion animation. (In other words, they usually come from within, rather than from some external place…like the right look of a model.) Still, you’re right – those that are made with video/photography require a lot of work too. I’d never heard of Being Jamie Baker but that’s an awesome trailer (too long but still awesome) and I’m going to recommend my library get it. Yeah, it is definitely too long, but the trailer definitely sparked my interest too, Steph. Hope that you enjoy it when you get a chance to read it. Wow, I didn’t think it could be possible, but finally I have seen a book trailer that has made me more interested in the book! The Tell Me A Secret trailer is the one I’m talking about, and I think its captivating style goes a long way to create atmosphere and draw curiosity. I’ve seen so many book trailers that seem far too sickly sweet, usually with a piano background that sounds like its straight out of a Tuesday afternoon made-for-TV movie. They actively put me off both the books and book trailers themselves, which is so sad, but the one for Tell Me A Secret has opened my eyes again. Thanks! You’re reaction is exactly the same as mine was to the Tell Me A Secret book trailer when I first saw it as well, Emma. I know what you mean about the piano background and cheesy factor that often accompanies many book trailer, which is really a shame, because as you’ve just admitted, it turned you off of reading not only the book, but also from the idea of checking out a book trailer at all. I know that there isn’t quite as much of a budget for book trailers as there is for movie trailers, but when people are so used to that sort of quality for movies, it’s hard to make something that is, without a doubt, subpar exciting. The Tell Me A Secret trailer is one that other book trailer producers should strive toward when coming up with their own content. Glad that this trailer has opened up your eyes again to what a book trailer CAN be like! The trailer for Tell Me A Secret is probably my favourite book trailer I’ve ever seen. It is just so beautiful. I completely agree with you, Aylee. It really IS beautiful. Catch Up With Hush, Hush Before Crescendo Drops Giveaway! Werewolf Week & Got Books? Event: It's A Sisters Red Blowout Giveaway!